Sorry for the delay in posting a meeting recap, but was away on business travel this past week! We had 11 boys, 4 junior rangers and three adult rangers present for our Stockade meeting on Monday night. With really nice weather, we took the opportunity to work outside on campfire basics and cooking “banana boat” desserts. Banana boats are easy to construct — just cut the skin away from the inner curve of the banana, cut a “V” slot into the banana flesh and then stuff it with caramels, mini-chocolate chips, and mini-marshmallows. Next, replace the skin flap and wrap tightly in aluminum foil – bake in hot coals of campfire for 10-12 minutes and eat with a spoon! Many of the boys took their treat home to share with parents. Select a safe place to build the campfire. Keep it away from trees, shrubs, overhanging branches or tents/buildings. A safe distance is about 12-15 feet. Always try to use an existing fire pit or fire place – fires built on the ground will prevent plants from growing there for many years (the soil becomes unable to feed plants). Keep the fire contained with a ring of rocks or within a special “fire pit” such as a metal tray or bin. Keep a bucket of water, fire hose, or bucket of sand nearby to put out the fire when you are done. A shovel is also helpful to help break up coals and be sure that the fire is fully put out. 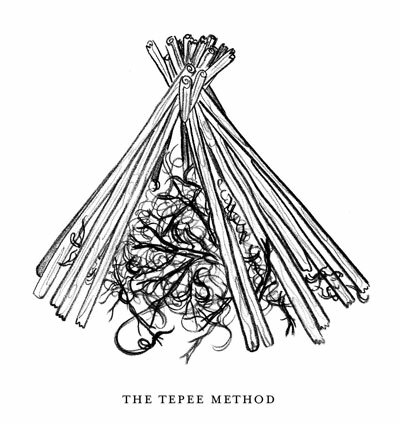 Tepee (Good for cooking) — Lay the kindling over the tinder like you’re building a tent. Cross (Perfect for a long-lasting campfire) — Crisscross the kindling over the tinder. 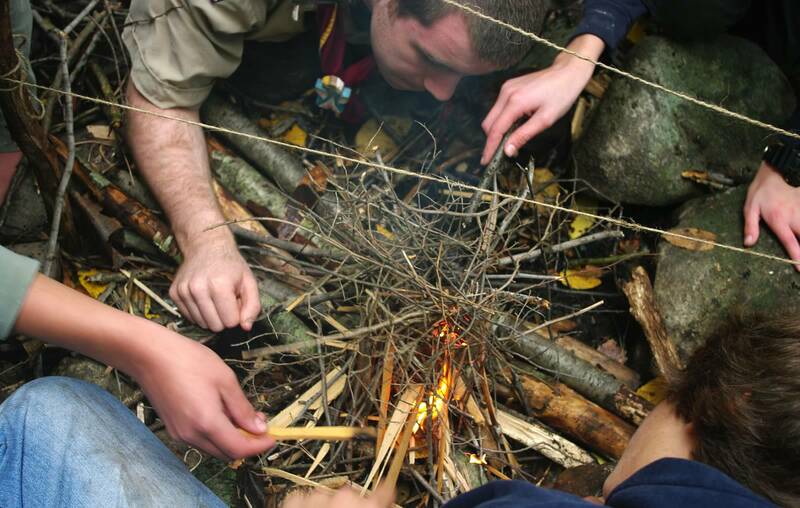 Lean-to (Good for cooking) — Drive a long piece of kindling into the ground at an angle over the tinder. Lean smaller pieces of kindling against the longer piece. Log Cabin (Longest lasting campfire) — Surround your pile of tinder with kindling, stacking pieces at right angles. Top the “cabin” with the smallest kindling. Do enjoy the warmth and glow. Do feel free to cook over your fire. Start early – it takes a while to fully put out a fire: give yourself at least twenty minutes where you stop adding any additional fuel. 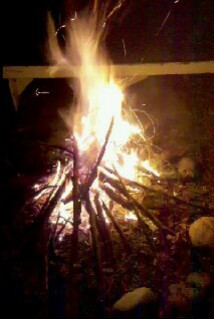 Let wood burn down to ash if possible, if not, sprinkle water over the coals and ash until the hissing and steam stop. Stir the remaining coals and ash – sometimes hot spots occur under the logs. Don’t touch coals/sticks to see if they’re cool, but you can place the back of your hand near them to detect heat. If they’re still warm, repeat sprinkling with water and stirring with the shovel. Clean Up Before You Leave! Campers should clean up their site of any trash (whether someone else left it or you did. Leave sites cleaner than how you found them. If you have leftover wood, leave it neatly piled for the next camper. There is power in fire – we can heat our homes, warm up on cold nights when camping, or even cook meals over a campfire. Sadly, fire can cause destruction, too – wildfires burn down forests and other fires can destroy people’s houses or cars. There is power in the words we speak – we can encourage other people, make them laugh or comfort them when they’re sad. In the same way that fire can be used for good or can cause destruction, our words can also hurt people’s feelings or damage friendships, too. In the Bible, there is a section in the Book of James that says “See how great a forest is set aflame by such a small fire! 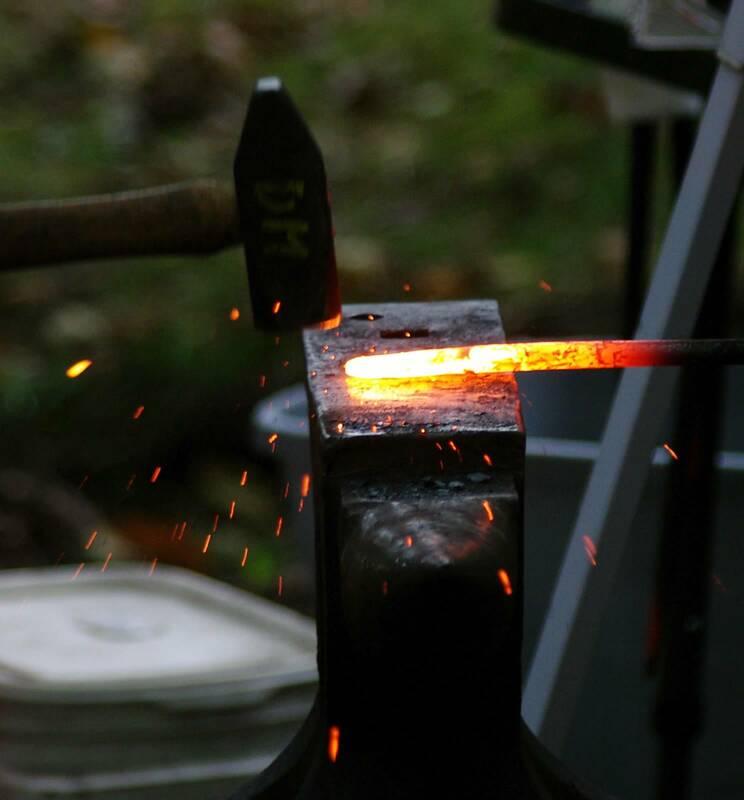 And the tongue is a fire…” If we’re not careful with fire, we can burn down a forest AND if we’re not careful with our words (how we use our mouth and tongue to speak) we could cause just as much damage among the people we care about. In the Bible, James continues to say “With it (our tongue/our words) we bless our Lord and Father, and with it we curse men, who have been made in the likeness of God; from the same mouth come both blessing and cursing. My brothers, these things should not be this way. Does a fountain send out from the same opening both fresh and bitter water? Can a fig tree, my brethren, produce olives, or a vine produce figs? Nor can salt water produce fresh.” We shouldn’t use our words to help AND to hurt – we ought to teach ourselves to always use our words to help other people, but it’s not easy. When we get angry or tired or frustrated we forget and say things that we shouldn’t say. We must learn to control our tongues and our speech in order to be consistent (helping instead of hurting). How can we do that? This entry was posted in Outing / Event, Unit Meeting Recap and tagged Banana Boats, Campfire, Christian Service Brigade, NVEFC, Stockade, Youth Group by Troop113. Bookmark the permalink.